Summary: The Northeast’s rugged glacial past is showcased by the stone walls that crisscross the region, binding home and hearth to the land. 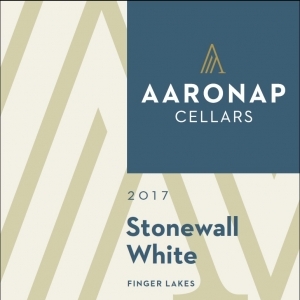 The glacial stones ground into the local soils over the centuries also provide a mineral backbone to this crisp dry white wine. Notes of pineapple, kiwi, honey, green aple, grapefruit, & grassy herbs grace the nose. The wine slides across the palate and lingers with a delightfully crisp mineral-laden finish. Delicious paired with grilled shrimp, grilled bluefish, roast chicken, basil pestos, roasted artichokes, or a creamy soft cow’s milk cheese. Aging Protocol: 11 months stainless steel. Seyval Blanc juice from Walker’s Fruit Farm in Forestville, NY was fermented at 55°F in stainless steel using Uvaferm SVG yeast. Malolactic fermentation was prevented by the addition of SO2 while aging over the fine lees in stainless steel for 10 months. A small portion of Muscat was added to elevate the aromatics. Prior to bottling, the wine was filtered to 0.45 microns. 600 lbs of seyval blanc & reisling grapes from Salt Creek Vineyards, South Dartmouth, MA were hand picked on Sept 25, 2016 and crushed together as a field blend. After 2 hours on the skins, the juice was pressed and blended with seyval blanc juice from Randal-Standish Vineyards. The clarified juice was innoculated with R2 yeast and fermented at temperatures below 60°F. Malolactic fermentation was prevented by addition of SO2 while aging in stainless steel. After 6 months, the wine was filtered to 0.45 microns and bottled. Reisling grapes from Salt Creek Vineyards, Darmouth, MA were hand picked on October 4, 2015 and whole-cluster pressed. The juice was cold settled, racked, and innoculated with Maurivin B yeast. Seyval blanc grapes were hand picked on October 11, 2015. After destemming, the juice was kept in contact with the skins for 1.5 hr, bladder pressed, and cold settled overnight. The clarified juice was combined with the reisling must and innoculated with Maurivin B. Fermentation temperatures were maintained below 60°F during the 14 day fermentation. Malolactic fermentation was prevented by addition of SO2 while aging in stainless steel. After 5 months, the wine was filtered to 0.45 microns and bottled.